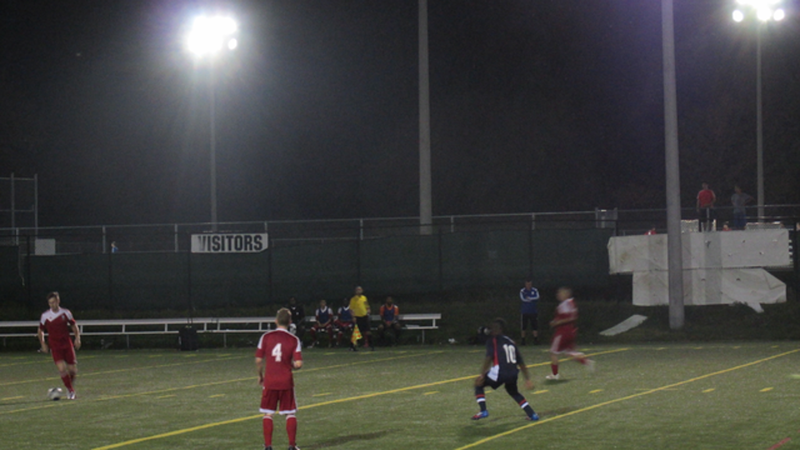 The benefits of youth were eventually realized on Saturday night in Vaughan, as a young Azzurri side stormed back after the interval to claim a 2-2 draw against the more experienced visitor's Masters FA Saints. Dressing many teenagers due to other commitments for regulars on the Azzurri squad, this youth of Vaughan showed a fighting spirit that served it well when falling behind 2-0 after Masters scored a pair of well-struck goals just before the half. Those goals came off the boots of Saints' veterans Josue Jarmalilio, better known for his silky through balls than his goals, and Alex Dimitriu, who is a regular goalscorer for Saints. That might have been enough for Vaughan’s players to hang their collective heads and figure it was only going to get worse in the second half, but the Azzurri came out for the second half on fire. Quick goals from Kai Olguin and Richard Parker inside the first five minutes of the second half set the stage for a battle for all three points. In spite of those early goals, neither side was able to earn the advantage, with both teams putting up the defensive wall after the flurry of goals early in the second frame, keeping the chances to a minimum. Parker, just seventeen, did cause havoc when he got the ball deep in Saints territory, and tried his best to open up the defence. He had several opportunities, and converted one. After an outburst that could have seen him carded, if not sent off, he was subbed midway through the second half. He admitted it was a challenge to play at the League1 level, but welcomed the opportunity after the game. “It was a bit rough, I felt we could do a lot better as a team. We fought back in the second half to tie the game, but weren’t able to finish our chances as well as we wanted to,” said Parker. Earning that single point in a game against a decent mid-level team is a good test for a young Vaughan squad at this point in the season.